When two souls plan to unite, which emotion does prevail in the whole affair? Of course, love! During a wedding why are the bride and the groom so happy? It’s because they are going to get their love ultimately! Why is a wedding called a Big Day or a Special Day? It’s because an individual’s biggest dream – getting true love – is fulfilled on that day! So, what else can be a perfect gift on a wedding than love poetry? Here is a collection of wonderful love poems – My Dearest Love-A Collection of Love Poetry By: M.R. Cooper. My Dearest Love: A Collection of Love Poetry is a beautiful collection of soft, delicate, colorful, fragrant, pleasing expressions of love in form of poems. It contains wedding vows too and a nice poetry which you can recite to your parents and family. There are beautiful poems in it which can be recited on a romantic evening, when you want to express your feelings towards your sweetheart, either directly or secretly! In short, this book is a perfect asset you should have if you call yourself romantic. 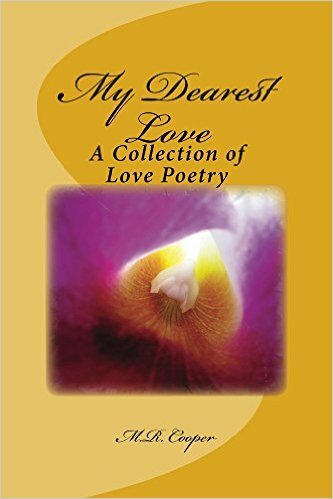 The soft poems in My Dearest Love: A Collection of Love Poetry are the creations of M.R. Cooper. She is an Ohio State University’s Bachelor of Arts. She has faced numerous challenges all through her life, but still standing firm and enjoying life to the fullest, with a happy family of husband – Marvin, and two children. M.R. Cooper is a lyricist and the creator of two poetry books, nine children stories and five plays. What is unique about her writing is it tells a story, provokes thoughts and takes you on a journey to another world. You can Become Creative too! With the website of M.R. Cooper, you too can trigger your creative quirk a bit – post a video of reading of any of M.R. Cooper’s poem on YouTube and send the link to them. The best video will be featured on the website. You can also participate in a draw held every month for those who buy any book by M.R. Cooper and post a review. Winners are given away a free audio book! So, if you are wondering what wedding gift to give to a wedding couple or your spouse, My Dearest Love is a super perfect give just made for the occasion.